Aputure Amaran HR672W. A medium size LED panel that can run on battery power. Late last year I decided to upgrade all of my LED lights. 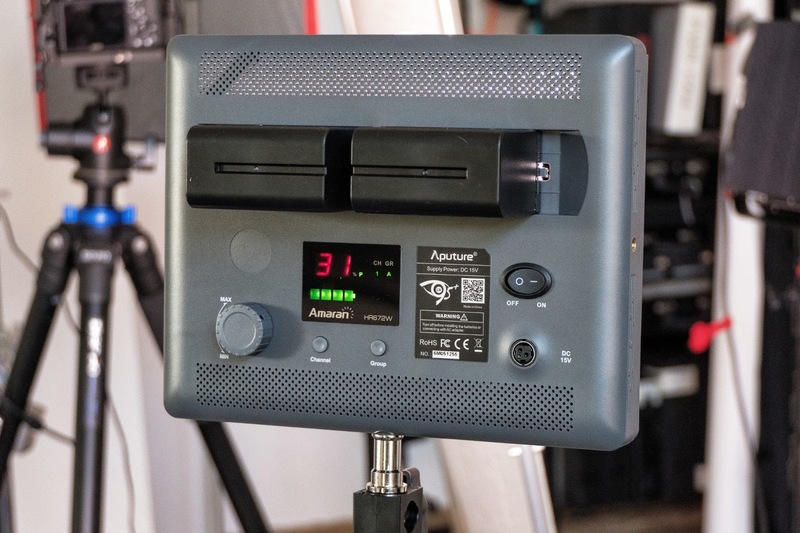 I did my research and decided that the price and performance compromise that made the most sense to me was the one offered by Aputure with their LightStorm series of panels. They have turned out to be great lights even though I find their A/C to power brick to panel connections a bit cumbersome. The light quality I am getting from them is quite good, and they seem to be living up to their press as 96+ CRI units. Flesh tones, especially, have been easy to nail in post processing. That's always a good sign. When I upgraded I spent a bit over $2,000 to get four units. Two of the LS-1S units (a high output, narrower beam fixture, with barn doors) and two of the LS-1/2 units (a broad beam, high output light that's half the size of the LS-1S). After using them on twenty+ projects I feel comfortable with the workflow involved and I'm pretty darn happy to have them. But recently I did a very detailed product shoot against a white background and I stumbled into the truism that every studio photographer knows well: "You always need just one more light for this project...." With two LS-1/2s lighting up the background that left me only two lights to do the heavy lifting of contouring the product while ensuring I had controllable fill light to the opposite side. A couple of times I wanted a bit of front fill as well and had to resort to a much smaller panel ---the kind you would use mostly mounted on a camera--- in order to get just a bit more fill to the front of a decidedly three dimensional product. One more panel, with more power and surface area, would have been just right. At the same time I was also looking for a smaller, less cumbersome panel solution for really quick, one man video interviews. Something I could put batteries on, toss some diffusion in front of and bring up the illumination on a subject who is being mostly lit by ambient light. One concern I had was that I didn't want to spend a lot of money on "one more light." I tried to buy one from my local Aputure dealer but it's not a stock item for them. I defaulted to Amazon.com and waited two long days to get my package. When I finally got the box open I was delighted to find a nicely thought out soft case holding the system together. I'm always delighted to get several more Sony NP batteries because there are so many products in the inventory I can use them on.....including my portable monitor. This package comes with two of the husky NP970 batteries. These will run the unit at full power for about one hour and thirty minutes, and at lower power settings for longer periods of time. They charge while connected to the panel via the power brick, which also supplies A/C power to the lights if you opt not to use the batteries. 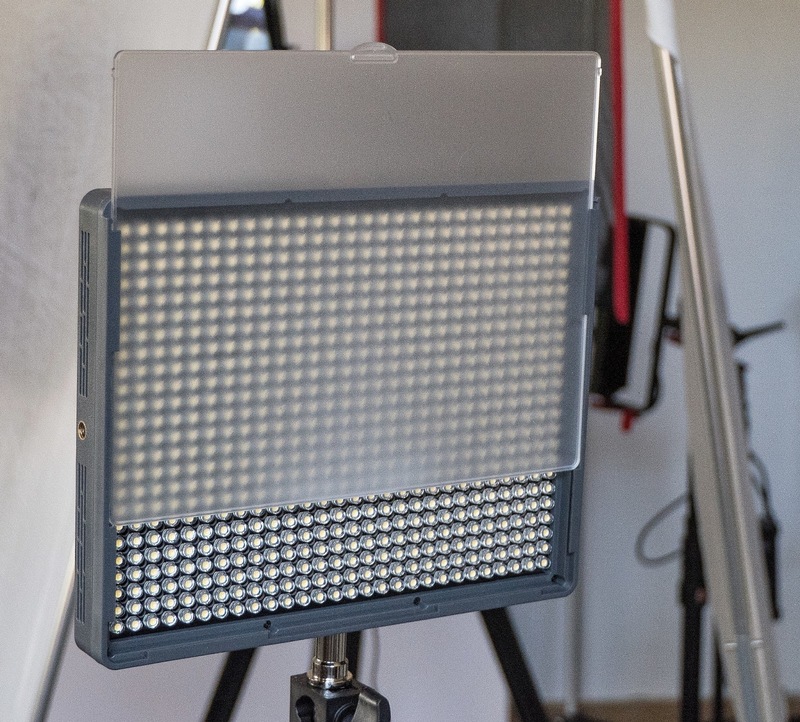 The light comes with a neutral diffuser that's good for taking the "edge" off the highly collimated LEDs, as well as a filter that converts the light temperature to match tungsten. A step-less dial on the back can set the output power from 10% to 100%, and your settings are easily repeatable because there is a big panel adjacent to the control that provides a numerical power indication. The panel also provides charging indicators for the batteries. The final cool thing that this light can do is that it can be remote controlled with a supplied, wireless remote. It's the same remote that comes with their bigger, more expensive lights. In fact, I can now control all five of the bigger panels with one remote control. I mostly leave the remote in the case and just set the control with my fingers. It gives me time to think about what I really want the light to do. But hey! if you are a tech junkie and love remotes, then there you go. The bottom line on any light purchase is the quality of light that the product delivers. Aputure has done a good job getting the message out that their line of lights provides 95+ CRI; from the smallest model to the top model. In comparing the output of the Amaran HR672W to that of the more expensive lights I previously purchased, I would have to say that they nailed the consistency feature. The lights are all daylight balanced and they all match each other. That makes my job easier and more fun. The only downside of this light is the build quality. While the more expensive lights are all metal and have gloriously big heat sinks on them, this model is made mostly of plastic and might not stand up to a lot of wear and tear. If you are a precise and thoughtful person the robustness, or lack of, is probably not going to be an issue. If you are the kind of person who runs around with cameras slamming together across their chest, and who literally tosses his stuff into cases without a thought for the effects of gravity or inertia, then you'll probably be bitching about stuff breaking in no time. The bottom line. Would I buy this product again? Yes. It's a perfectly good compromise between build quality, performance and cost. The price? Around $275. I give it four out of five happy camper awards. The one "camper" deduction is the build quality. I'm good with it.